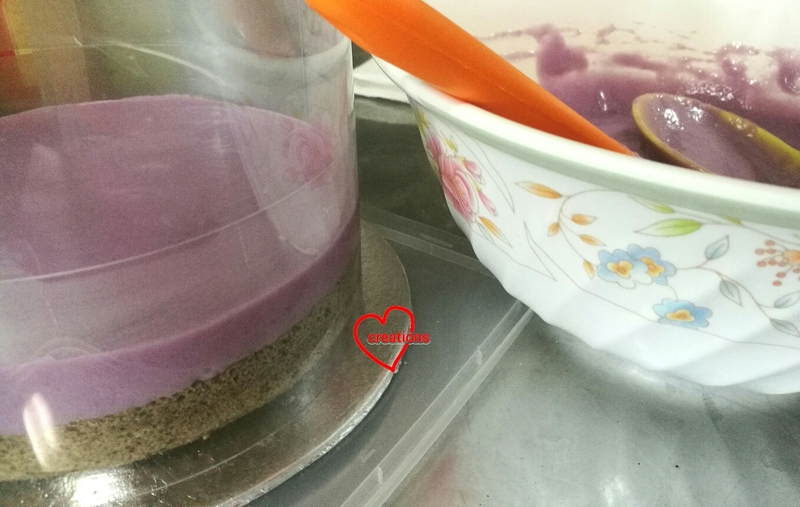 Pulut hitam (black glutinous rice) chiffon cake with purple sweet potato pudding and topped off with sweet potato Ondeh-Ondeh! Absolutely no artificial colouring is used. I used only Gula melaka or coconut palm sugar as the sweetener in the chiffon cake, and the pudding is adapted from here with only 20% of caster sugar that the original recipe suggested. You may think that this cake will be bland tasting but far from it, it is really flavourful from the harmonious blend of black glutinous rice, coconut milk, pandan, Gula melaka and sweet potato, but yet it is not too sweet! 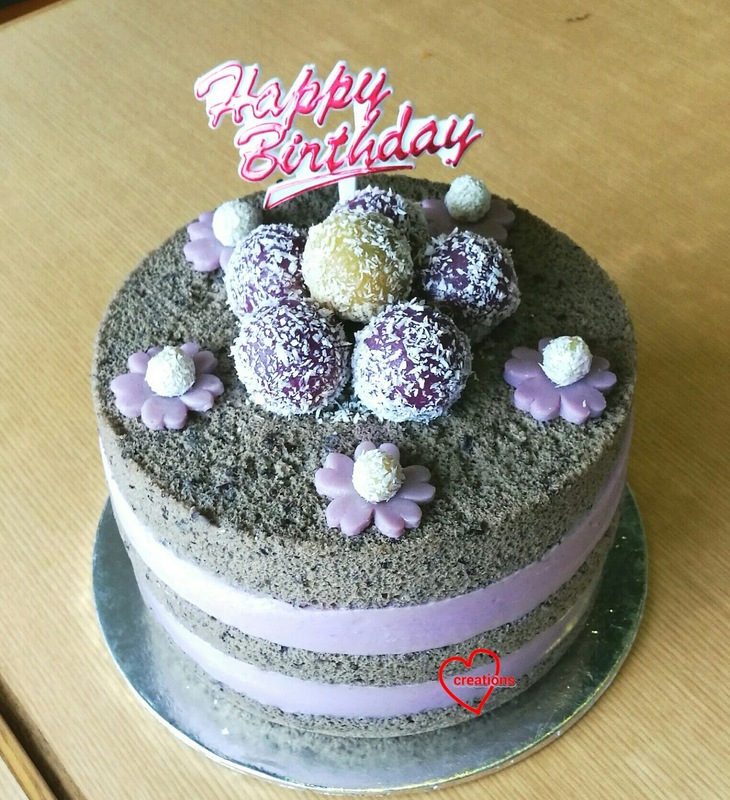 This cake may appear simple but it is made from scratch with a lot of love. 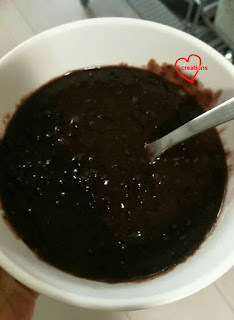 I began by cooking the black glutinous rice porridge. You may refer to this post for the recipe for the porridge. 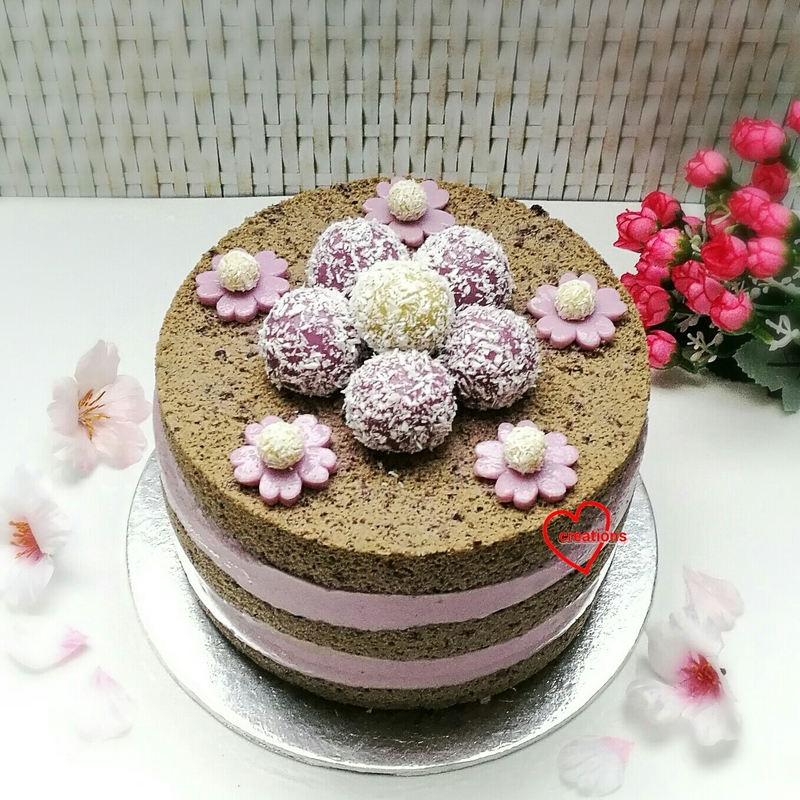 Although I provided the recipe for the pulut hitam chiffon sponge in that post, I tweaked it to make it suitable for baking in a chiffon tin as it needs to be more structurally stable than when you bake a flat layer cake. You may choose to use a recipe that uses black glutinous rice flour but the flour as not as easily available as the raw black glutinous rice grains and I find the flour sold in Singapore isn't as fragrant as the ones from Indonesia that my friend gave me a few years ago. Personally I prefer the version baked by using the porridge. I also usually sneak a bowlful to eat as it is one of my favourite Asian desserts! 1. Set oven rack to second lowest position. Place a tray of water at base of oven (optional). Preheat oven to 150℃. 2. Whisk egg yolks until pale and thick. Add oil and whisk until well combined. Add coconut cream and porridge and whisk until well combined. 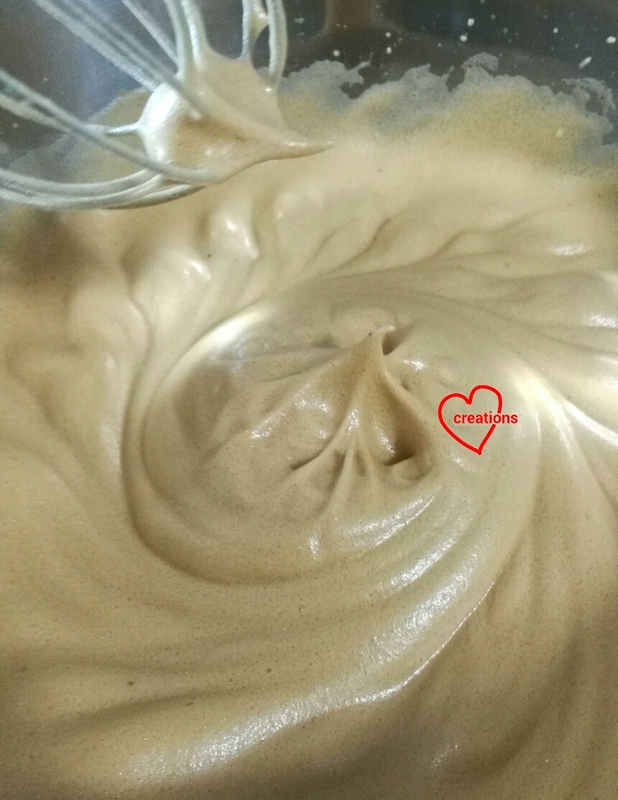 Gradually add in sifted flour, salt and charcoal powder and whisk until no trace of flour is seen. 3. In a clean metal bowl, beat egg whites with cream of tartar until firm peaks form, gradually adding in Gula melaka once the egg whites are foamy. 5. Bake for 15 minutes and then reduce the temperature to 130℃ and bake for another 30 min. Reduce the temperature to 110℃ and bake for another 10-20 min or until skewer comes out clean. Bake the sheet cake for 15 min or until skewer comes out clean. 6. Invert immediately when removed from oven to cool. When completely cooled, carefully unmould the cake from the chiffon tin by hand. 7. 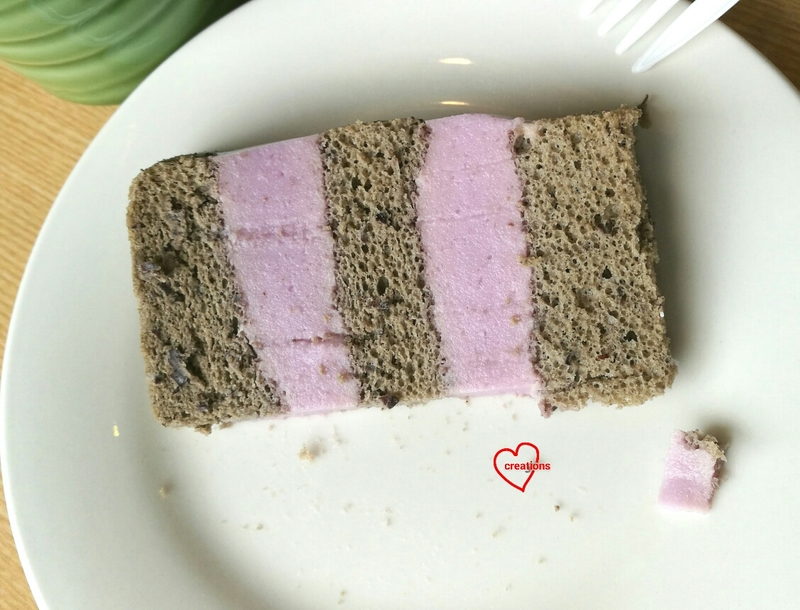 Slice the chiffon cake horizontally using a long serrated knife into two, three or even four slices as you wish. I use a ruler and toothpicks as markers to indicate where to slice horizontally. Keep the sliced cake in airtight container while you prepare the pudding. 1. Place all ingredients in A) in a saucepan. Mix together B) ingredients in a bowl. Mix together C) ingredients in a jug. 2. Bring A) to boil, stirring frequently. Make sure that all the agar powder is dissolved. 3. Add B) to A) and bring to boil while stirring. 4. Stir C) again as the cornflour would have settled to the bottom. Slowly pour in a small and steady stream into the saucepan while stirring the contents in the saucepan. Continue stirring while heating over medium-low heat for another 2-3 minutes. The mixture will thicken. 5. Pour the contents of the saucepan through a sieve to remove any lumps that may be there. 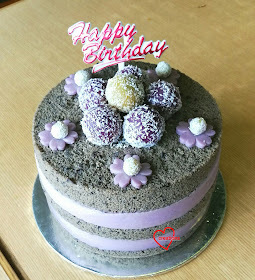 You may use a springform pan or flexible clear cake plastic rings like what I used. 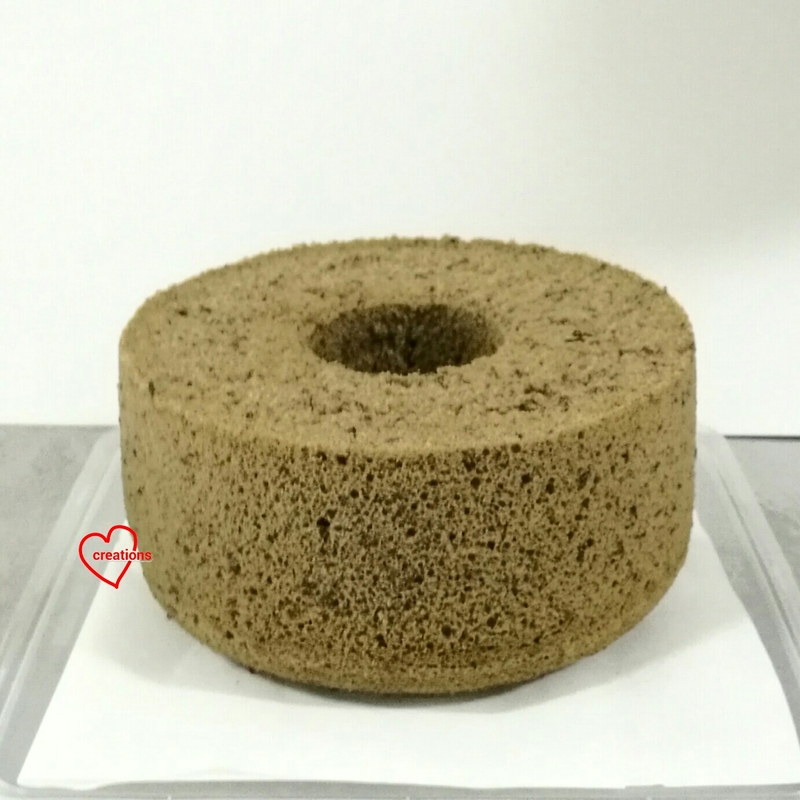 If using the plastic rings, make sure that you prepare the bottom layer of sponge on the cakeboard with the plastic ring secured before you make the pudding. 1. 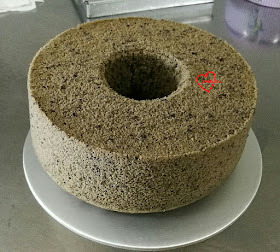 Place a layer of sponge on cakeboard with the cake plastic ring. You may cover the hole with a round sheet cake cutout from the sheet cake if you wish. 2. Use a ladle to scoop some pudding to cover the sponge. You may layer it as thick or thin as you want. 3. Place the second layer of sponge on top of the pudding carefully. Gently but firmly press it down such that the pudding comes into contact with the sponge. 4. Repeat steps 2 and 3 until you have the desired number of alternating layers. 5. Cover the top of the assembly with cling wrap. Refrigerate for 2h or overnight. Carefully remove the plastic cake ring. I chose to decorate with some purple sweet potato pudding flower cutouts and sweet potato Ondeh-Ondeh. You may refer to this post for the recipe for Ondeh-Ondeh. This cake is really lovely for those of you who love pulut hitam and coconut milk combi but want something not so sweet. My friend who took some extra cake that I made let her parents-in-law try. They loved it so much that she wants me to bake that for her father-in-law’s birthday! The freshly baked chiffon cake looks so inviting I just had to take a photo of it! 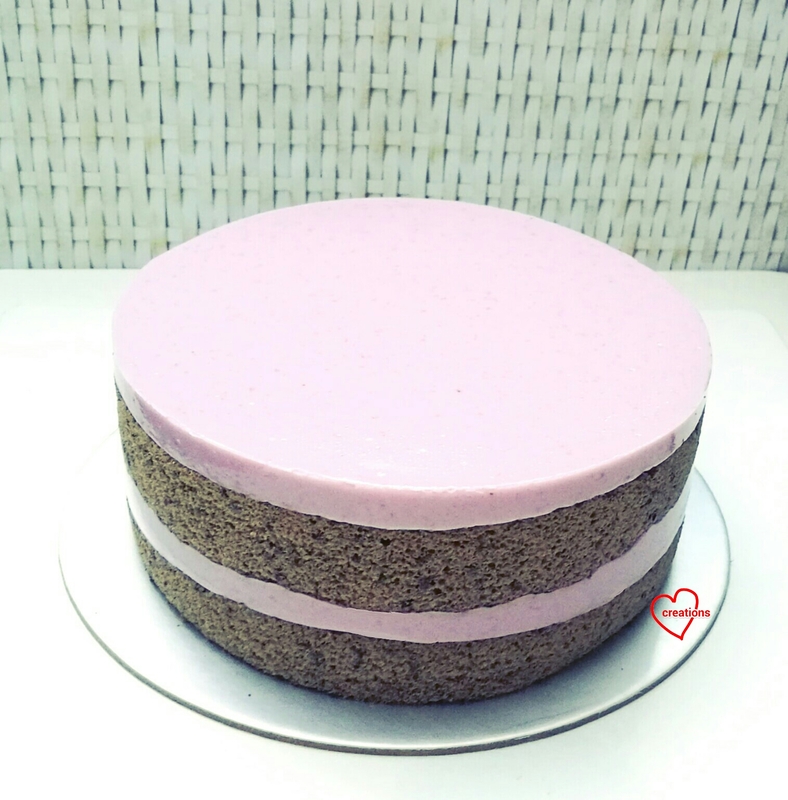 I made a bigger 17cm chiffon cake. Hi, how can I contact you? I would like to order a cake fr my daughter's birthday party on 4th August. I am not free for early August as my schedule is full for the next few months.